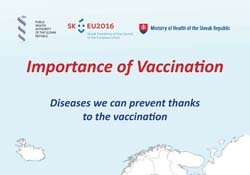 goals, objectives and strategies adopted by Member States of the WHO European Region in the European Vaccine Action Plan 2015–2020. Communicable diseases do not respect state borders, which is why exceptional attention must be paid to cooperation, coordination of procedures, information sharing and common rapid response to these threats among countries. This new publication will be used to draw attention to these issues for the duration of Slovakia’s Council Presidency (through 31 December 2016) and beyond.